LOT Publications Webshop. 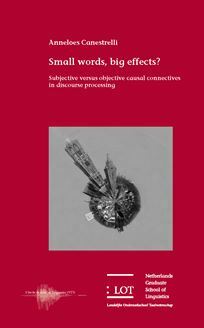 Small words, big effects? Coherence relations and their linguistic markers play a significant role in the study of discourse processing and comprehension . A number of studies have shown that the presence of coherence markers , such as connectives , in a text facilitates discourse processing and representation . The current study focuses on causal connectives , and investigates how the information that is encoded in their processing instructions affects online discourse processing . More specifically , it investigates whether these connectives provide cues about the fine - grained distinction between subjective and objective causal relations . This question is relevant for two reasons . First , in many languages of the world causal connectives seem to specialize in either subjective or objective causal relations . And second , subjective causal relations are assumed to be more complex than objective causal relations . In order to investigate this issue , this study includes a series of eye - tracking experiments involving both backward ( want versus omdat ) and forward ( dus versus daarom ) Dutch causal connectives . The results reveal that causal connectives do more than just inform the reader that a causal coherence relation needs to be constructed between two pieces of text . They also provide information about the relative degree of subjectivity of that causal relation , which immediately affects online discourse processing . In addition , the results shed a new light on the source of the processing complexity of subjective causal relations .